Volume can be useful in determining the strength of a price movement. 1. Why Use a Logarithmic Scale to View Stocks? 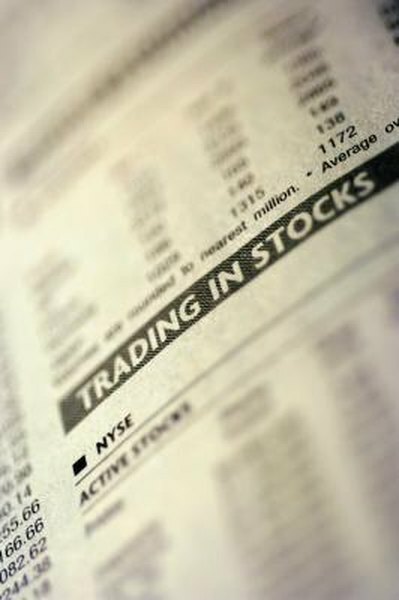 The number of shares bought and sold through an exchange over a given period is commonly called a stock's volume. Traders and investors often track volume levels to help them decide when to buy and sell stocks, with the aim of taking a position or locking in profits from a position they already hold. You can track volume visually or manually. Many brokers offer their clients charting software as part of their service package. If you have an account with a brokerage, check to see if charting software is available. If not, numerous websites offer free charting software. Type "stock charts software" into your favorite search engine and browse through the options. Type the name or ticker of the stock you want to analyze into your charting software. The ticker is the two-, three- or four-letter abbreviation used to identify a publicly traded company. This will bring up a chart of the company's stock price movements over a set period. Or you may decide to analyze a stock index such as the Dow Jones Industrial Average or the Standard and Poor's 500, both of which represent large groups of stocks. This may be more useful if you prefer to invest your capital in indexes rather than individual stocks. Almost all charting software offers the option to overlay indicators onto your charts. Locate the indicators list and select "Volume." This will insert a histogram below the price chart. Each bar on the histogram represents a time frame equal to your chart's period setting. For example, if your chart period setting is 30 minutes, each bar on the volume chart represents 30 minutes of trading. The numbers along the vertical axis of the histogram tell you how many shares were exchanged over the period, so the higher the bar, the higher the volume. Most charting software will automatically insert a moving average into the volume indicator histogram. A moving average is a line plotted from a preset number of preceding periods. The default moving average on the Free Stock Charts site, for example, is preset to 50 periods, meaning it calculates the average volume of the previous 50 periods of trading. You can use this moving average to track whether the volume is rising or falling over time. The setting can be changed to alter the calculation time. A lower setting, 20 for example, will only use 20 previous periods and will be more reactive to short-term volume changes. A higher setting will be less reactive to short-term volume changes. If you do not need a graphical representation of volume, many websites offer volume readings. For example, if you type a stock's ticker into Yahoo Finance, it will display the key statistics for a company. One of these statistics is labelled "Volume," which is the number of shares traded between the opening of the exchange on which the stock is traded and the time when you are looking at the stock. You can manually track this figure at the end of each day, over a period of weeks or months, to gain insight into whether trading volume is rising or falling. Samuel Rae is an experienced finance journalist whose work has been published across a range of different sites and publications in the financial space including but not limited to Seeking Alpha, Benzinga, iNewp, Trefis and Small Cap Network. He holds a BSc degree in economics.